We share the road with many people, some of whom may be better or more responsible drivers than others. Regardless, it's important that we be responsible when we share the road and that we abide by posted laws and signs. Of course, that is the ideal, not the reality. There are many cases in which negligent motorists put others on the road at risk. It's important to have skilled personal injury attorneys on your side to hold negligent drivers responsible. We want to take a few moments right now to consider the various dangers posed by and experienced by teenage motorists. This will allow us to address a number of issues related to driver experience. Regardless of age, an inexperienced driver is in a unique situation. He or she may pose dangers to other motorists due to a general lack of familiarity of the road or the realities of driving. This lack of experience can also be a danger to the inexperienced motorist himself or herself. To be a good driver, it really does take time behind the wheel and actually being on the road. In addition to driver inexperience, teenage drivers can sometimes be particularly reckless behind the wheel, prone to take risks that more seasoned drivers would not. This includes racing at stop signs, speeding, texting while driving, or even running red lights. Given how some teenagers are with drugs and alcohol, there is also a likelihood of teens driving under the influence or driving while intoxicated. Driving is a privilege, not a right, and all such dangers that are posed to others need to be taken very seriously. Conversely, teenage motorists may be too conservative or unable to react intuitively given their relative lack of road time. When an emergency vehicle approaches from behind, for instance, some teenage driver may not realize that they should pull to the side of the road to give that vehicle the right of way. Or if another motorist is driving recklessly, an inexperienced driver may not know how to react to such behavior. It's important for teens to learn how to drive defensively and smartly, as this will help them prevent harm to themselves caused by others who act irresponsibly. Whether a teenage driver caused an auto accident or your teenage son or daughter was the victim of a negligent motorist, our legal team will be here for you. Our auto accident attorneys fight diligently for the rights of all accident victims, and we will help ensure that you receive just compensation following any kind of motor vehicle collision. We want the roads to be safe as much as you do. 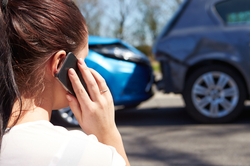 If you or someone that you love has been involved in an auto accident of some kind, it's important that you contact our White Plains, New York personal injury attorneys today. The entire team here looks forward to meeting you in person and helping you achieve just compensation following any kind of serious injury that has been caused by a negligent person or party.